The phrase “Pura Vida” which means “Pure Life” perfectly describes the vibe you feel in Costa Rica. The Costa Ricans also known as “Ticos” live by this phrase every day and use it as a greeting, a response, or just to say “Pura Vida”! It is no mistake that Ticos take this phrase very serious, as Costa Rica has been named three times as the happiest place on Earth in 2009, 2012, and 2016 by the Happy Planet Index. Costa Rica will instantly capture your heart from its gorgeous green landscape rich in biodiversity, the deliciously, unique tropical foods, and the amazing people who live on this little piece of heaven! These reasons alone, have propelled Costa Rica to become a hotspot for many people all over the world. If you are looking for a variety of things to do, Costa Rica has it all! From zip lining the high luscious jungles in the mountains of Arenal or Monteverde, to riding a 4x4 along the beautiful coastal beaches, you will not be disappointed. 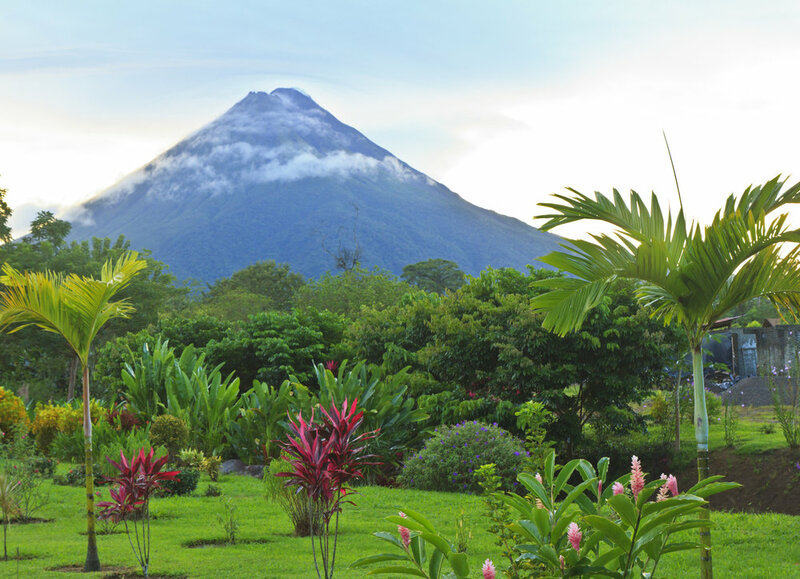 Soak in natural hot springs with a grand view of the gorgeous Arenal volcano will take your breath away. Near Arenal is also the famous Rio Celeste, which is a hike in the green jungle to arrive at turquoise waters and waterfall that is a world wonder to see. Costa Rica has two beautiful coastal places to discover which is the Pacific side or the Caribbean side. The Pacific side of Costa Rica is home to many gorgeous beaches which are all different in their own way. The Puntarenas Province, which includes beach towns such as Santa Teresa, Montezuma, and Mal Pais is the perfect place to get away from the crowd and enjoy a rural beach town with dirt roads perfect for renting an ATV. You may feel like you are off the grid because you have to take a forty-five-minute ferry across the peninsula to reach this amazing place, but it is so worth it. On the Caribbean side, the spot to go to is Puerto Viejo with its clear waters, wild nightlife, and the famous Caribbean dish “rice and beans” which is deliciously made with coconut. The beach at Puerto Viejo may not be the best one, but its neighboring ones such as Punta Uva and Manzanillo are worth a visit. The reggae vibes, bars, and restaurants aligned right next to the beach create a perfectly fun getaway to partake in the festivities. If Costa Rica has been on your list for some time, make the plans and go! The people, the food, and the beautiful luscious country will not disappoint!